The slogan of world’s leading creditcard couldn’t be more on spot. Mastercard is an excellent way to safely and fastly make deposits to your favorite Online Casino. Are you not yet a member of Royal Swipe? Signing up is free and easy; Join now! Or should we say plusses. Mastercard is renowned for being secure and insured. So no surprises afterwards. What if we could make it even better by adding free playmoney to your account? Can we? We do! Yes, it actually says that: we give you Welcome Bonus 100% up to $/£/€100 + 20 Free Spins on Shaman's Dream on your first deposit! That means that if you deposit 20 eu/gbp using Mastercard, you can play with you 100% bonus as well! No codes needed, no special offer, no nothing. This is what everybody gets when playing on Royal Swipe Online Casino! Also want a free welcome bonus? Join now! It takes only two minutes to start playing over 400 game titles on our Online Mastercard Casino. First off, sign up by filling in the registration form and verifying your account with your mobile phone. After this is completed, choose Mastercard as your deposit method and simply make your first deposit following the steps shown on the screen. Voila! You now get to play with a Welcome Bonus 100% up to $/£/€100 + 20 Free Spins on Shaman's Dream! And the fun doesn’t stop there! We have promotions every week; the more you play, the more we pay! 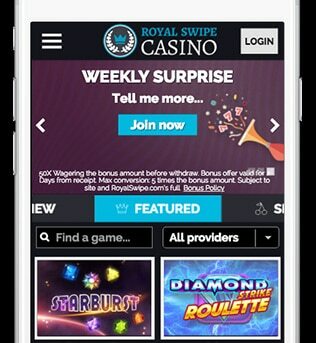 It doesn’t matter if you want to play on a desktop, laptop, tablet or mobile phone: you can play at Royal Swipe anytime you like, wherever your prefer!